Claude Lanzmann, The Last of the Unjust, 2013, 16 mm and 35 mm, color and black-and-white, sound, 218 minutes. 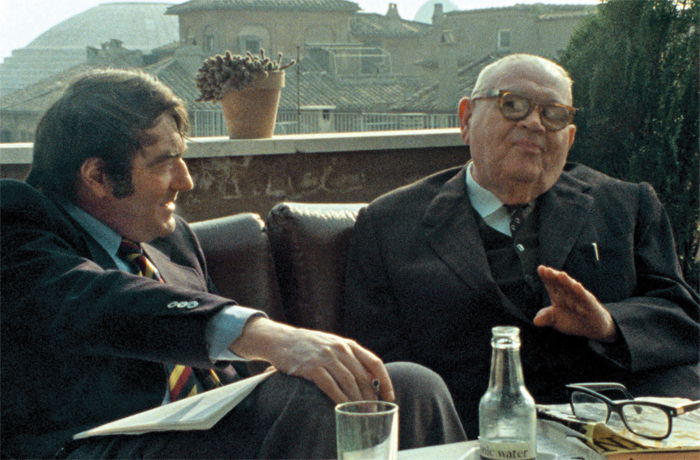 Claude Lanzmann and Benjamin Murmelstein. December 1944: Benjamin Murmelstein, a Vienna rabbi, is appointed by the Nazis as the third (and last) Jewish “elder” of Theresienstadt (Terezin, in Czech), a “model” or “showcase” ghetto set up in the former Czech Republic in 1941, his two predecessors having been executed the previous May and September. Murmelstein retains this position through the war’s end. Then, after spending eighteen months in prison for his collaboration with the Nazis, he is acquitted of all charges (although still widely despised as a traitor) and moves to Rome.